A £9million legal battle triggered by a council planning error has left two former businessmen bankrupt after their High Court appeal was thrown out. Bill Schiavone and James Fawcus took Worthing Borough Council to court after a ‘fundamental error’ in the authority’s paperwork eventually led to the collapse of their care home business. Work had commenced to renovate their Winchester Road care home, only for planning permission to be later quashed because of the error, leaving the duo unable to complete the works. A High Court claim was dismissed last December, with the duo’s final hopes dashed by the rejection of an appeal last Friday. The saga started in December, 2009, when plans were granted for the disused Ravenswood care home. Contracts were signed and works began, only for a disgruntled resident to launch a judicial review against the decision. The permission was flawed because it failed to attach a full summary of reasons and policies, which at the time had to be included by law. The duo claimed a council solicitor duped them into signing a ‘consent to quash’ order, which they thought would speed up the reconsideration of the plans, instead of fighting the lengthy judicial proceedings. The council denied the allegation. But by signing that document, the businessmen waived the council’s liability to compensate them for their losses. They believe they could have persuaded a judge not to quash permission and even have been awarded statutory compensation. The care home business collapsed under the pressure of lost revenues. Both men have now been left bankrupt, facing £30,000 of legal costs from the legal hearings. 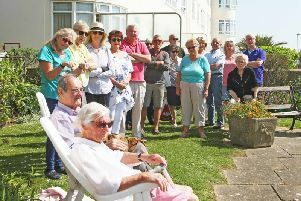 A spokesman for Worthing Borough Council said the council were not vulnerable to future issues with granted planning permissions. “After this case the council ensured that every grant of planning permission clearly stated the reasons for the grant of planning permission,” she said.